Your Saudi Arabia bank account and remittance center accounts will be freezed, If your iqama/Muqeem expired, So before expiring of your iqama or muqeem card withdraw all money from your bank account. You can submit a copy of your new muqeem card in bank and remittance centers to unfreeze it. - Iqama renewal in Saudi Arabia must be renewed at least 3 days before of its expiry date. - If your company has less than 50% of Saudi's, there will be a fee of SR 2400/- for labor office. However, This fee will be exempt for 4 expatriates, if your company (small business) has less than 10 employees. - Few of Residents from countries (Djibouti, Eritrea, Ethiopia, Kenya, Nepal, Nigeria, Somalia, Sudan, Thailand, Vietnam) have to provide medical test report while renewing muqeem. Once this process is finished, Your sponsor will collect your old iqama and get print of new muqeem card within two working days. Do not forget to collect a letter from your employer that your iqama is in under renewing. Attach your old iqama copy to that letter, this will be your temporary iqama. - You can get free SMS from MOI (Ministry Of Interior) regarding your services, if you are registered with them (Procedure to register in MOI). 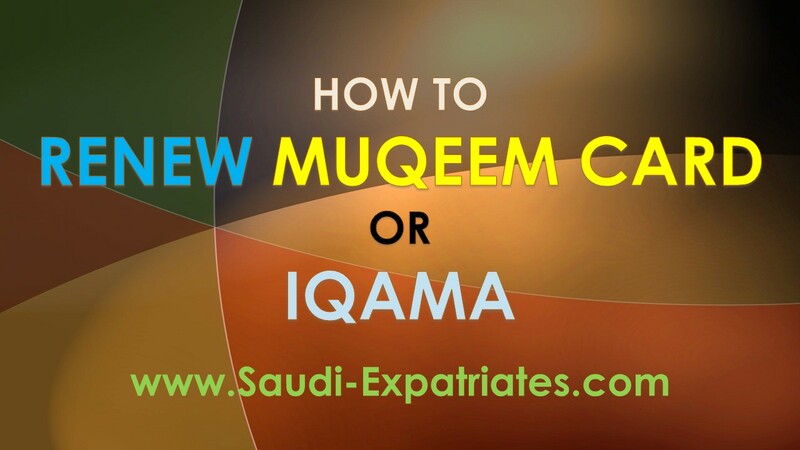 - Check (Muqeem Card) Status of Iqama renewal in Saudi Arabia (Saudi Iqama Status Enquiry). Maximum how many months before we can renew iqama? You can able to renew iqama before 3 months of its expiry date. Can I know how to renew Family Iqoma if in case I should do it by my own since I am on a single status in the company. Or is it mandatory for the sponsor to renew our Iqoma along with my Family's.